What’s in there? What’s not? How does your garden grow? Compost, and lots of it. At our previous house, I used a metal trash can with a tightly fitting lid. I made holes in the bottom for drainage. I found I could roll the trashcan around the yard to aerate it. It worked really well but it didn’t make the move with me last summer so I had to start again at our new place. I started with a four dollar clear plastic tub that I found at my local box store. I got the largest available box. I chose clear so the sun could heat up the mix, but I think black would also be a good choice. I put about a hundred holes in the bottom of the box with a nail. You need holes in the bottom so the water can drain from your compost. I have four kids for a total of six people in my house, it’s not difficult to have enough kitchen scraps to add to the compost. 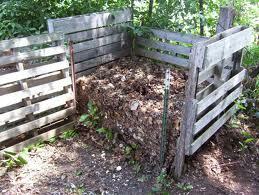 I must say that while I still compost in the bin, I have since started an open composting pile as well. I just needed more compost than the bin was able to produce. So, what’s in it? Just about anything, but not everything. 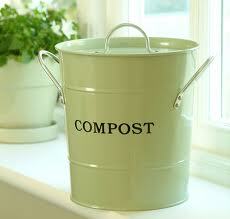 As a general rule you can add most kitchen waste to compost. I don’t put meat or meat products in my compost. We have foxes in our area, they already like my yard being ours is the first house they come to when they emerge from the small copse of trees at the edge of our property. I don’t encourage them if I can help it. However, I do add fish to my mix from time to time. I am pretty careful to wrap the fish in coffee grounds and newspaper when I add it. I add garden dirt to the bin occasionally as well. I have only had occasional trouble with pests. The foxes will come for the eggs if I don’t mix them far enough down. 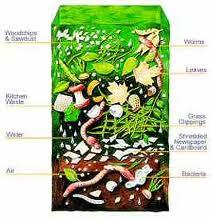 Compost needs three things to fulfill its destiny, heat, moisture and mixing for air. I guess all that’s left is to caution against what most likely should not be allowed in your compost. Manure from meat eating animals (humans included) No kitty box clean outs, dogs etc. If you live by a zoo you can ask for the elephant poop but not the lions. News print that is shiny or slick. Newspapers use vegetable dyes that are just fine but the shiny slick magazine type paper can contain heavy metals that you don’t want leaching in to your water table or veggies. Occasionally I will have some volunteer plants in my compost, I just yank them and compost them as well. This happens most often with pumpkins, and potatoes. I have been known to move a volunteer to the main gardens if there is a healthy specimen. I mean…c’mon…it’s beaten so many odds, it would be heartless not to give it a hand, right? I keep a large bowl on the kitchen counter to put all the scraps in then just take them out to the main pile of an evening. I have noticed that many companies now carry dedicated kitchen counter compost pails. Some of these are so fancy, copper or stainless steel with fancy liners and charcoal filters. So paisley, I wish I had one. For now, I’ll use my plastic mixing bowl that was inadvertently left on the stove burner so that it’s lopsided. In a way I guess it’s appropriate for compost scraps. This is really the ultimate in recycling and waste management. Our family of six went from four large cans of trash to one and a half to two a week. Plus all this works together to feed our gardens. Win-win-win (as Michael Scott would say) Go forth and compost, and have a paisley day.